PEACOAT Proenza Schouler. MARNI golden brogues. LEATHER NOTEBOOK Smythson. NECKLACE Stella McCartney. MAKE-UP PALETTE Dior ‘Grand bal’. CLUTCH Mawi. PERFUME Byredo ‘Blanche’. ROSE GOLD HEADPHONES Nixon. KNITTED SWEATER Altuzarra. SCARF Diane von Furstenberg. WATCH Michael Kors. BOOK ‘Kate: The Kate Moss Book’. EARRINGS Erickson Beamon. BOOTS Sigerson Morrison. EYELINER Nars. CANDLE Cire Trudon. This entry was posted in Inspiration and tagged Byredo, Kate Moss, Marni, mawi, Michael Kors, Proenza Schouler, wishlist by Carolina Engman. Bookmark the permalink. Wow you picked some nice pieces! So nice..the brogue are amazing! This is a great list. the colors are putting me in the holiday mood. Wow, LOVE the Sigerson Morrison black boots! mmm yes a girl can most definitely dream! Love the brogues and jumper inparticular and those home goodies would make gorgeous christmas presents…. Amazing! I kinda want all of this! Great selection! So beautiful! Love the shoes and clutch! Oh I see lots of beautiful items! I’m in love too with the Net-a-Porter agenda!! A girl has to dream and you’re really doing it right! I love those golden brogues and that watch! great wish list! love the gold shoes! Great pics! Love the booties!! wow, definitely some dreamworthy items! that one biiig wishlist haha. but christimas is not that far ;) that notebook is really sweet by the way! I think pretty stationery makes every job nicer! This knit is amazing!!! <3!!! The booties and clutch are gorgeous! In love with that Altuzarra sweater! Such great choices. Oh my goodness! The golden brogues! Hamana hamana hamana! what a wonderful collection of items…those golden shoes are golden! OHH so nice everything ! I want the golden oxfords !! This watch is my fav.!??? Work a note of graphic allure into your ethnic inspired knits with Proenza Schouler’s grey, black and moss green intarsia knit pullover, as a boxy silhouette showcases off-duty cool. gosh the watch! my heart is stolen! I really love the gold shoes on the top! They’re just amazing! Perfect choice. I really like it. I would like to have boots, sweater and watches. Have a ncie day. Very nice post Carolina! 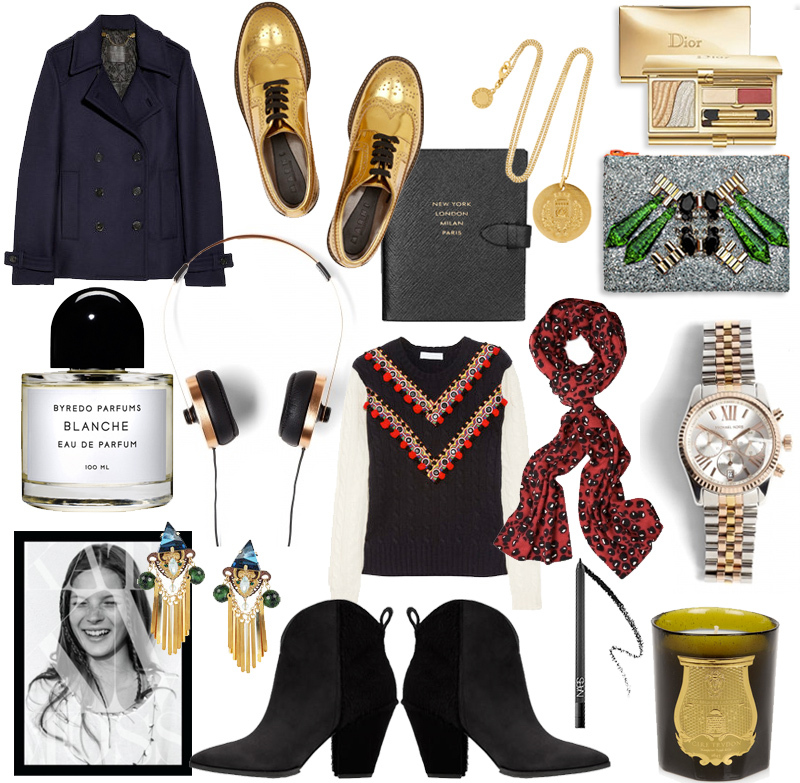 I love everything on your wishlist, especially the golden Marni brogues. Great wish! Um, I want everything? Is that doable? Oh i LOVE those Morison boots. stunning! those earrings and the boots are pretty sick!love! Wow, the make up and the booties are very pretty. Great picks! Love the coat, he can go with everything! Great post! I really love the gold shoes on the top! They’re just amazing! xoxo Laura! I love all of these, especially the shoes and the headphones which look incredibly cool and would be easy to match with clothes! Oh my god, NEED those shoes. Love the rose gold headphones and the notebook! Saw this post on weartoclick.com and OMG love all of these picks! Especially the MARNI Brogues.